Paint Store :: Shop by Brand :: American Safety Razor :: AMERICAN LINE 65-0002 PRO WIDE BLADE SCRAPER TOOL. AMERICAN LINE 65-0002 PRO WIDE BLADE SCRAPER TOOL. 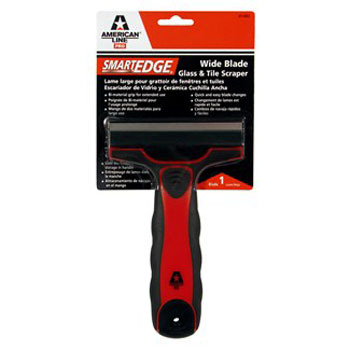 With a new locking design, on board blade storage and a comfort grip, this wide blade scraper will allow the professional painter to remove paint, adhesives and decals for any hard surface, including glass, tile, stone and block.Works great with American Line 4" scraper blades. Locking design holds blade securely. Bi material grip for a secure hold. Blade storage in the handle. DUCKBACK SC-1910-4 NATURAL EXTERIOR TRANSPARENT STAIN CLEAN AIR FORMULA 100 VOC SIZE:1 GALLON. DAICH RR-189 ROLLER ROCK SIZE:5 GALLONS.